The Philippines are having a rough time of it at the moment with their latest tropical storm, so I thought I'd do a blog about one of their favourite snack foods. 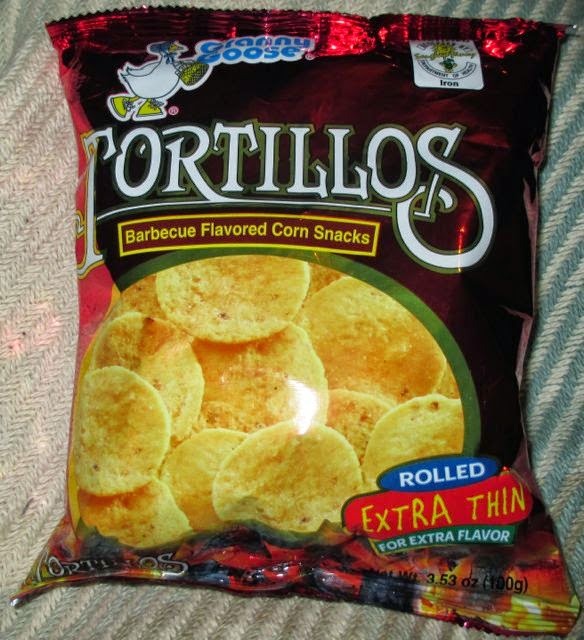 It stated on the bag that these Granny Goose Tortillos Barbecue Flavored Corn Snacks are made from the "finest ingredients", but one could be mistaken that some of them had been grown in a laboratory. Not a good start to the blog I know, but I'm a big fan of natural ingredients so looking at the back of the bag had been my first mistake. Hopefully there would be no others. Although it did state; "Outrageously crispy, perfectly spicy and totally smokey", which encouraged me a little. So I flipped back to the front of the bag and noticed the rather nice picture of well rounded Tortillos. They say being able to draw a perfect circle is a sign of madness... Well, never mind. It did state that these Tortillos were "rolled extra thin for extra flavor" and extra crispness I presumed, as I desperately tried to ignore the missing "u" in the word "flavour"! 100g bag. Manufactured by Universal Robina Corporation, Philippines. Ingredients are fortified with iron and included; corn vegetable oil, yeast extract, spices, silicon dioxide, caramel, sugar, iodised salt, hydrolysed vegetable protein, tricalcium phosphate, maltodextrin, monosodium glutamate, and ferrous sulcate.